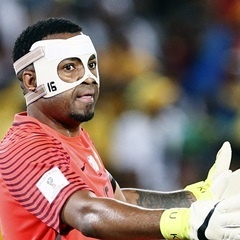 Cape Town - Bafana Bafana goalkeeper Itumeleng Khune says their defeat against Senegal in a crucial 2018 Soccer World Cup qualifier was a bitter pill to swallow. The must-win match took place last Friday evening in front of a packed Peter Mokaba Stadium. However, it was not to be Bafana Bafana’s night as their dream of traveling to Russia for the grand spectacle did not come to fruition following a 2-0 loss. The 30-year-old reflected on the match after he risked aggravating his injury to play with a mask. After sustaining a facial injury during a Telkom Knockout clash against Chippa United on Sunday, a day before reporting for camp, Khune said despite the setback he was determined to defy the odds and do everything to represent his country. The medical team put Khune through an intensive rehabilitation process during the week in camp and the inspirational goalkeeper responded well and was named captain on the day. "Having to play with the mask was a risk I had to take because I always put my country first and I enjoy what I do. For me it was a simple decision to make though it was a frustrating week ahead of the match," said Khune as quoted from the official SAFA website. "But on the day of the match it is when I made the biggest call because I really wanted the country to qualify for Russia though the result didn’t go the way we all wanted. "I am happy I played and took the risk, this is a calling from God that I should help the nation. "I had to answer the call of South Africans and had to play in a mask, though some people made a fun of it." Khune and the rest of the Bafana Bafana squad have already landed safely in Senegal for their final qualifying match against The Lions of Teranga.